The stages in the 2017 Dakar Rally are only getting trickier as the days go by, and Stage 4 has had its fair share of dropouts. The first part of the stage comprised of soft sand and then fine dust, which made it all the more tricky to tackle. 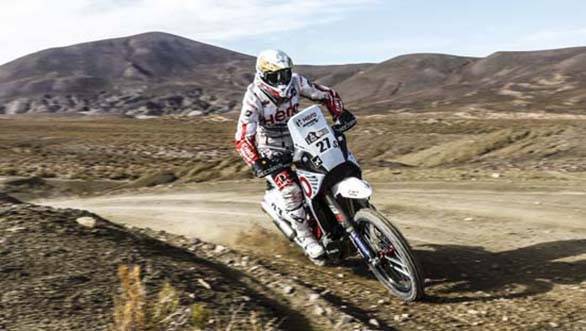 However, Hero MotoSports Team Rally's CS Santosh and Joaquim Rodrigues have made it through to Stage 5 without any major mishaps. Rodrigues finished the stage in 5hr37m48s to take an impressive 9th place in this stage. He managed this despite having stopped twice at accidents to call for the rescue helicopter. He also got stuck and struggled with the loose sand in the first half of the stage, but is happy to have made it through without any injuries. His 9th place finish in Stage 4 has pushed him to 12th in the overall bike category. After a poor finish in Stage 3, Santosh started 104th which meant he had to deal with all the loose sand and dust left behind by the previous riders. He got lost for a while during the stage, but managed to collect all the waypoints and any avoided any penalties. Although he crashed a few times and caught himself being out of breath while picking up the bike due to the high altitude, he managed to finish the stage in 64th place with a time of 6hr41m43s. This moved him up in the overall standings from 104th to 77th.